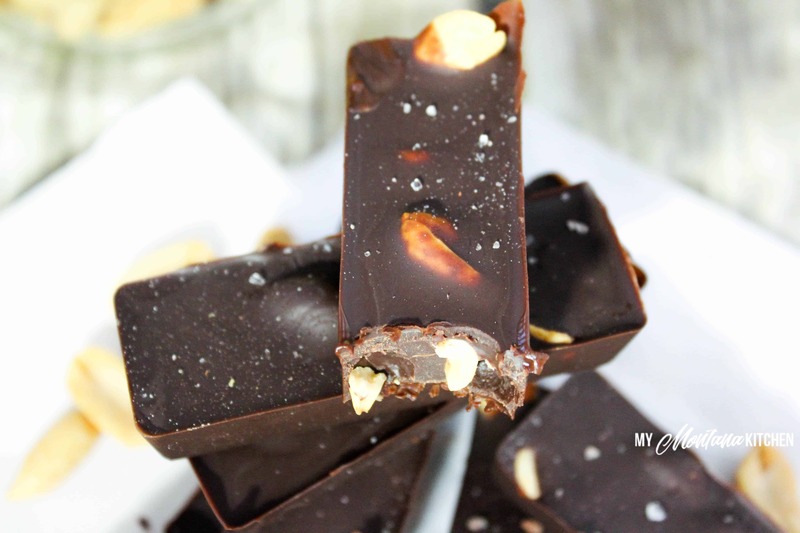 This easy candy bar only has 4 ingredients, and reminds me of a Mr. Goodbar! Rich and chocolatey, with pops of peanuts and a sprinkle of salt. This recipe is low carb, sugar free, dairy free, and a Trim Healthy Mama S Fuel. 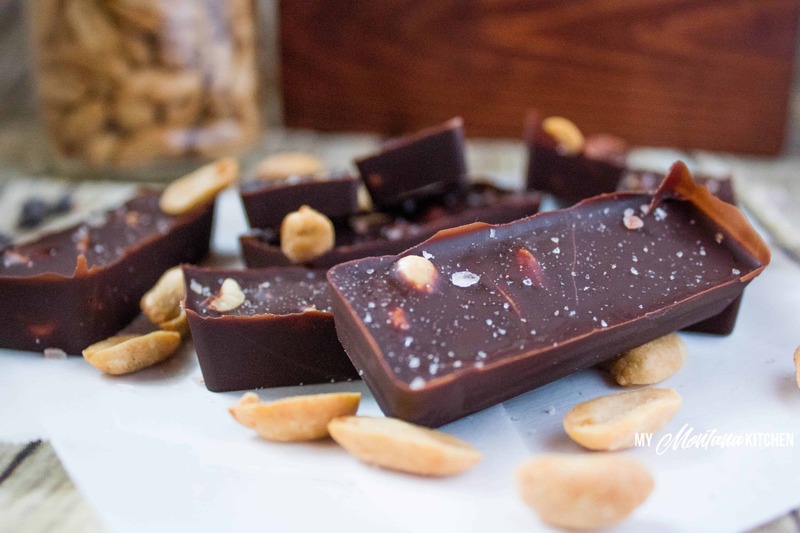 After making Salted Chocolate Almond Bark a few months ago, I knew I wanted to try to make a THM version of a Mr. Goodbar. Pre-THM, my favorite candy bar was a toss-up between Snickers and Mr. Goodbar. I have a Snickers bar here, but I had yet to tackle a Mr. Goodbar replica. While this does not taste “exactly” like a Mr. Goodbar, it is absolutely delicious! Low carb candy doesn’t get any easier than this, either. You simply melt the chocolate chips with a little bit of coconut oil, then layer with peanuts and top with salt! I believe these could also be made with the Trim Healthy Mama Skinny Chocolate, but I have not tried that version. That option would be much more budget friendly if you do not have money in your budget for sugar free chocolate chips. 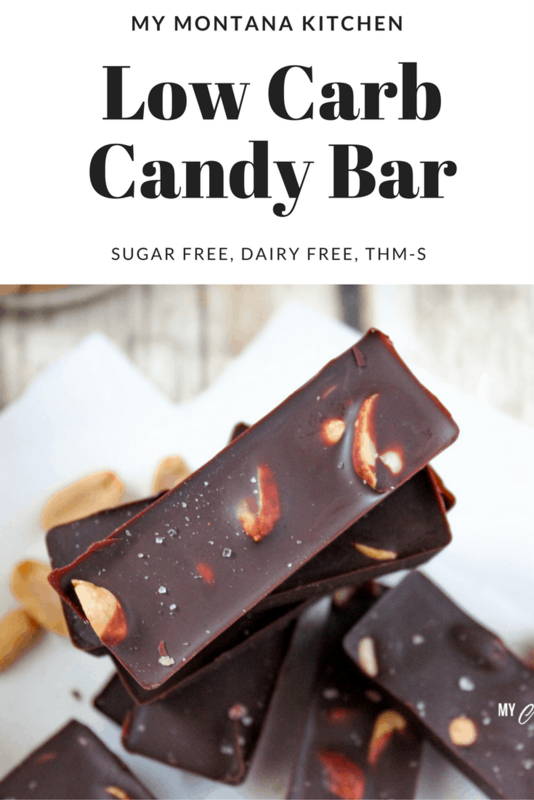 I used the Trim Healthy Mama Chocolate Chips for these low carb candy bars. I actually like them better than Lily’s Chocolate Chips for candy making/coating. They are delicious, and I just got word that they are back in stock! You can purchase them here. These Low Carb Chocolate Peanut Candy Bars even passed the husband and picky children test! 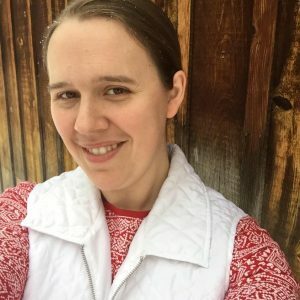 (My husband is not picky, but my 9 year old is!) Anytime that a new recipe gets approval from my husband and my children, I call it a success! 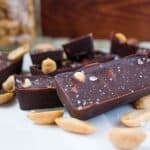 So what do you need for these Low Carb Candy Bars? Using a bar pan, place 1 Tablespoon of melted chocolate in each cavity. Cover peanuts with remaining chocolate. Sprinkle with coarse salt, if desired. Store leftovers in refrigerator or freezer. I use a bar pan like this one. If you do not have a bar pan, you can line an 8x8 Pyrex dish with parchment and do the layers that way. Then simply cut into 9 bars. Can I make this with 85% chocolate bar? Would I need to add sweetener? If so, how much? My husband is new to THM ( yay! ), and I would love to make him these bars. I have Lily chips only at the moment, would I need to add more sweetener if using the Lilys? No, not at all! You can use them as an equal replacement! Would using butter instead of coconut oil change anything? Thanks so much!! You could pour the mixture into a parchment-lined 8×8 pan, then cut it into bars or break it into pieces.